Letitia performs in schools, theaters, nightclubs, colleges and parks. She also adds an unusual zest to conventions and promotional events. Letitia Bartlett is currently Artistic Director of Make-a-Circus, a San Francisco based children’s circus/theater company. Her specialties as a mime and a clown have kept her busy performing throughout the USA, Europe and Asia over the last 15 years. 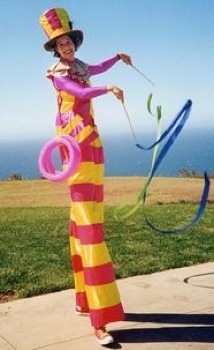 She has been a member of the Kite Tails Mime Duet, the Tandy Beal Dance Company and the Denver Center Theater Company.